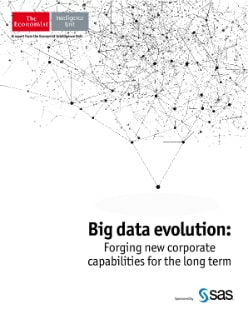 Big data evolution: forging new corporate capabilities for the long-term is an Economist Intelligence Unit report, sponsored by SAS. It explores how far along companies are on their data journey and how they can best exploit the massive amounts of data they are collecting. Research findings are based on a global survey of 550 executives (conducted Feb. 2015) and in-depth interviews with senior executives.